We start out in the middle of the desert with Crowley. 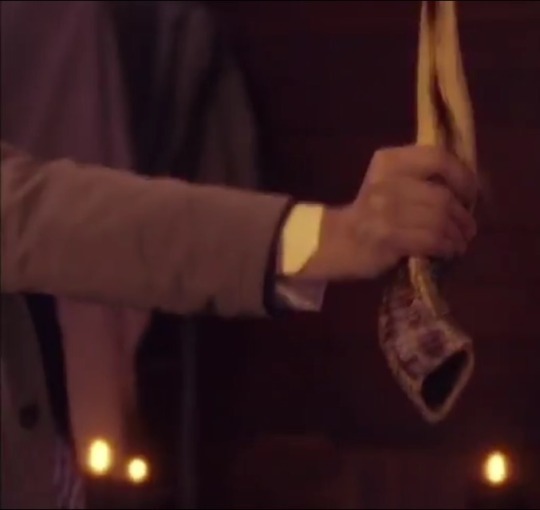 The Horn of Joshua, that is what Crowley is after. I am not a religious person so I am not sure what this horn is supposed to do. I guess we will find out soon. You ever watch a movie that has gangsters riding around on the outside of cars looking for rival gang members? Maybe a couple right. Now imagine that the gangsters are demons and the rival gang member is Crowley. That is how Lucifer is out looking for him. I think that takes a bit of his credibility away, don’t you? I am literally six minutes into the episode and I am already asking so many questions. The biggest one at the moment is, How the hell is Rowena alive? Lucifer broke her neck! Crowley has the Horn of Joshua and lets the boys know that it is the only thing that will destroy Lucifer and the Darkness. It has been touched by the hand of God, my only problem with this is the fact that they already had a couple of things that were touched by God’s hand and they were one hit wonders. That has me worried for this horn. Will this too be a one hit wonder? Lucifer is in heaven talking to all of the angels, I don’t think it is going well for him. Of course they all think he is evil (because he is) and he is just trying to tell them how God did him dirty. I am almost feeling sorry for him, almost. It is so strange to hear Lucifer come out of Castiel’s mouth. What sounds like a good idea? Summoning Lucifer. Yea that sounds like how I want to spend my Saturday night. What the hell has happened? Apparently Crowley is joining Lucifer in Castiel’s mind? Can a vessel really hold an archangel, an angel, and a crossroads demon at the same time? I don’t think this will end well. The boys will have to exercise Crowley as soon as possible. The Horn doesn’t work and Amara takes Cas/Lucifer. What could she have in store for them? I am sure it is nothing good. Will Cas survive this? So many questions, I only hope we get some answers soon.